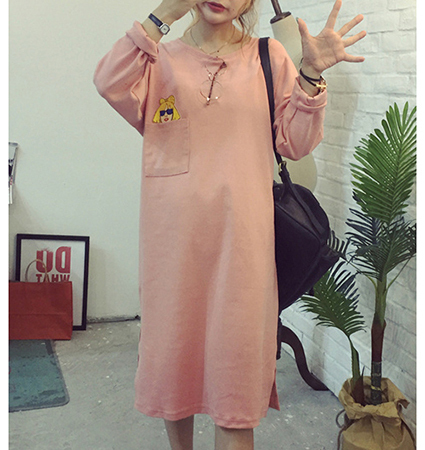 This is a casual women’s midi shift that is presented in a lovely peach color. It has a high, rounded neckline with a small bow at the center as a decorative detail. The sleeves are long and full enough to be rolled up or left full length. A single breast pocket exists with a whimsical logo featuring a tiny blonde head wearing sunglasses, peeking up over the hem of the pocket. This dress is a loose, comfortable fit. The hemline ends below the knee in the mid-calf area of the leg. The dress zips in back. This dress is available for purchase in sizes Small, Medium, Large and Extra Large.